Welcome! Flawed yet Functional is a space to encourage and inspire thriving health by healing the body through food and lifestyle habits. My health journey is wide and varied, yet the healing I’ve experienced is so incredible that I must share it with you. Click on Journey below to learn more. Changing my diet has been critical to healing my body, so I share recreated favorites and new dishes that are compliant with the Autoimmune Protocol, Paleo, or Keto diets. Click on Recipes to get see some delicious food inspiration. Maintaining healthy habits is crucial to management of my blood sugar. Click on Habits to read what I’m working on. Working with my hands brings me joy, and I love sharing things I create here. Click on DIY below to see attainable, doable projects you can create in your home. Flawed yet Functional means I may not be perfect in any area of my life, but I can continually work to improve and live a fulfilled life. I’m living my best life, and I want to encourage you to do the same. Click on one of the photos below to learn more or just scroll down for the latest posts! Disclaimer: I am not a medical profession giving medical advice. Sharing my health journey and healing is to inspire you to think critically about your health, encourage you to think differently about autoimmune diseases, and give you courage to live your best life. Welcome to Flawed yet Functional! 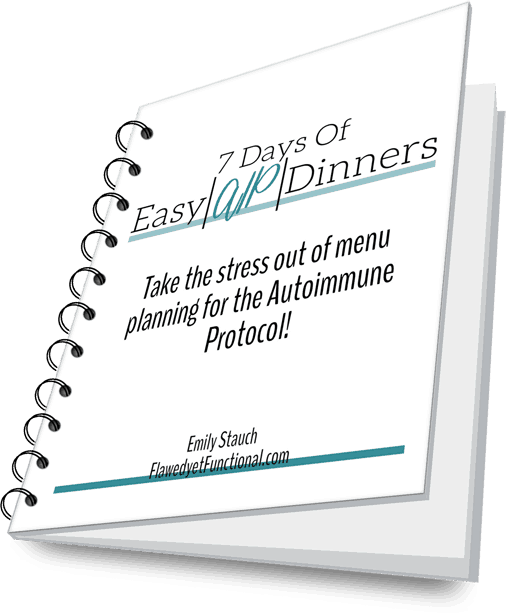 I am Emily Stauch, and I am using the Autoimmune Protocol to control my blood sugar and overall health as a Type 1 Diabetic. (Get to know me more here!) You know what that means, right? I spend a LOT of time in the kitchen! A deep thinker at heart, I’m always looking for ways to spend less time in the kitchen. I want to spend time with my kids too! In the last two weeks, I’ve had a light bulb moment for a little kitchen tool that I’d love to share with you: use disposable plastic kitchen gloves for all the things. It will save your sanity (and your hands) as a mom with young kids!